My friend David recently decided to take a road trip around the US visiting friends along the way. It was meant to be 3,000 miles in 7 days. To date, his great adventure has taken him 4,700 miles and 17 days. The additional miles and days were added for one very simple reason: life happens. The unexpected came his way. Days ago, it was a fuse that blew five times on the leg of one trip. Another time it was realizing he was close to a friend and didn’t want to pass up the opportunity to visit him when what stood between them was less than a hundred miles. Especially in light of the fact they live well over 1300 miles from each other. 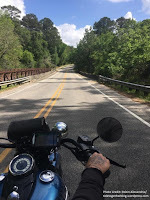 He even spontaneously accepted the invitation of two bikers on the road along Hwy 90 headed towards Alabama for some lunch and a beer- an adventure that wasn’t planned but turned out to be worth taking.